Good or bad, it won't be the same without you, Julius. He was a skin-and-bones swingman from Harlem when he came to the North Carolina State University campus as a freshman in the fall of 2001. The Wolfpack was coming off of a grinding 13-16 season. And here was this kid declaring that he had come to Raleigh to win a national championship. Even the Wolfpack faithful were shaking their heads at the bravado. The rest of the Atlantic Coast Conference was snickering. And there he was, leading NCSU to a 23-win season that year, along with its first winning conference record and NCAA tournament appearance in a decade. In the second round of the 2002 NCAA, with time running down and trailing Connecticut by three, Hodge was the one taking a three-point shot for the tie. Although the shot wouldn't go down, I remember thinking at the time that this kid had a great future ahead of him. Hodge's career came to an end tonight with a 56-65 loss to Wisconsin in the Sweet Sixteen of the NCAA tournament, State's fourth trip in four years. That Hodge was even around to celebrate a senior farewell tour was a miracle in this day and age, but Julius made a promise to his mother to get his degree while he was still actually in college. He was the reigning ACC Player of the Year, and everyone was sure that Hodge would enter the NBA draft. When he called a press conference to let everyone know that he was coming back, NCSU was a preseason top-25 team. After all, hadn't this team placed second in the ACC last year? Julius Hodge didn't repeat as ACC Player of the Year; heck, he didn't even make the All-ACC First Team in his final season. And, heading into this year's ACC tournament, it looked more probable that Hodge would end his career in the NIT rather than the NCAA tournament. The Wolfpack and Hodge suffered its first losing season in conference play in four years, and a team that began the season 8-0 and ranked 12 in the nation finished at 17-12, 7-9 in the ACC. Hodge was as emblematic of the disappointment as anyone. Hodge finished this season with 2,040 points for his career, which puts him behind only Wolfpack greats Rodney Monroe and David Thompson. It wasn't an easy year. An outside shot that was unorthodox to begin with seemed remarkably ineffectivea lifetime .342 three-point shooter, Hodge shot .246 from beyond the arc in 2005 on only 41 attempts. And one of the cornerstones of Hodge's game, free throw shooting, plummeted this season. After shooting better than 80% for his career, Hodge shot an sub-par 67% in 2005. He was so befuddled at the beginning of the year that when the Wolfpack lost at Washington in December on an apparent no-call as Hodge was driving toward the basket, one of the Huskies players derisively commented, "So what if he'd gotten a couple of free throws? Who says he's going to make them?" Injury, meet insult. In the News and Observer message boards following last year's NCAA loss to Vanderbilt, a Wolfpack fan posted, "I'm not sure if he's the worst best player I've ever seen, or the best worst player I've ever seen." At various points in his career, Hodge has been accused of being selfish, brash, and overhyped. And there are those that will say he's shown more mouth than results, that NC State couldn't even win an ACC championship with him, much less an NCAA title. Well, let me say that as much as I've screamed at the television this season, as frustrated as I've been with the team in general and Hodge, at times, in particular, I am going to miss the skinny kid from Harlem running around the court. Say what you want about Hodge and a jump shot that sometimes looked like I was the one taking it. I've been watching him for four years, and I can tell you that there is no one in the building that wants to win more than Julius Hodge. As we close the book on Hodge's career at NC State, I'm going to remember the failuresnot because of the disappointment that I may have felt but rather because of the images of Hodge, spent at the end of each game, shedding tears about letting his teammates down. Sinking at midcourt after missing a 25-footer against Connecticut in 2002. Losing to California in overtime the following year in the first round, literally crying in frustration. Sitting numbly on the bench in the second round of 2004 after fouling out with 2:44 to go, watching Vanderbilt erase a ten point lead in less than three minutes. And finally, watching a dejected Hodge disappear down the tunnel after losing to Wisconsin in the Sweet Sixteen of 2005. I'll remember Hodge in these failures because I know that they meant something to him. He wasn't just thinking about his NBA stock; he wanted to win so badly that it hurt him to lose. But to remember only the failures would trivialize the man's career. In the five years before Hodge showed up on campus, the Wolfpack had been relegated to a third-tier ACC team, going 26-54 in conference play, and hadn't sniffed the NCAA tournament in a decade. In four years with Hodge, the team was 36-28 in conference with four straight appearances in the NCAA tournament, capped by a trip to the Sweet Sixteen for the first time in 16 years. Oh, and this was a team that in early February was 13-10, 3-7 in conference. Hodge was the personification of a gritty team that refused to quit when a lot of people had given up on them. Scratch away the veneer of trash-talking bravado, and you'll find the heart of a man who wanted to lead his team to glory, and who took losses the way someone else takes the death of a relative. Remember the years of referring to the ACC tournament play-in game as the "Les Robinson Invitational?" 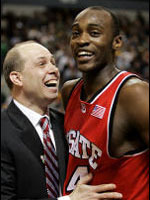 I prefer to remember a player that deserved every success he had while leading NC State back to consistent respectability. So thanks, Julius. You and I both wish you could have won that national championship, or maybe an ACC title or two, at least. Life has its little disappointments. You came here, you gave it everything you had, and you left it all on the court when you played. Who knows how the Wolfpack will fare without you in the years to come, but good or bad, it won't be the same without you, Julius.